As a parent we are always looking for the safest products for our children. For me, plastic was a key element that I wanted to try to reduce as much as I could. This began my search for plastic foodware alternatives. Glass was ruled out due to the delicate nature of the material and the probability that the item would probably be thrown around when put into a toddlers little hands. This lead me into researching into stainless steel alternatives. Stainless steel is safe, durable and dishwasher friendly. 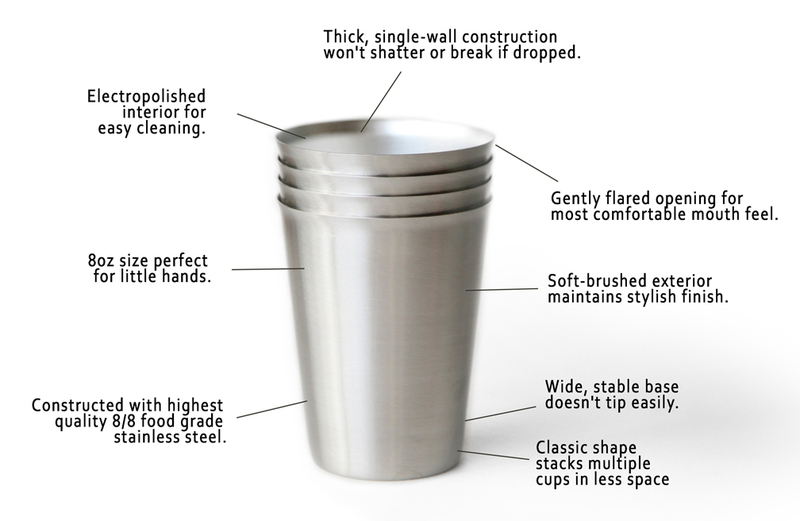 After looking into various stainless steel options, we really liked the products that Caveman Cups offered. Read below to learn more about this company and why KIDKATAT recommends it as a solid plastic alternative for your little ones! Great innovative clean rim design that makes it easy to clean and easy for little hands to hold and use. They now offer plates and bowls as well! KIDKATAT had the pleasure of talking directly to the team behind Caveman Cups. 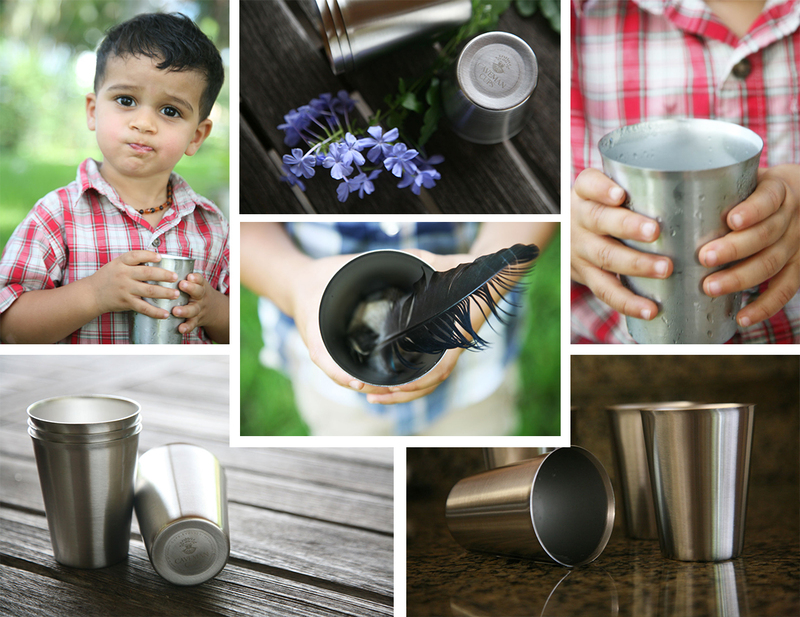 Read on to learn more about Caveman Cups and how you can purchase some for you and your little ones! KidKATAT interviews the people behind Caveman Cups. When was Caveman Cups created? Who is involved with the company? Caveman Cups was born in mid 2015 and our first product, the Cub Cup was launched in November 2015. It was founded by a full time Homeschooling Mom, who now takes on the role as Company Founder, Operations Manager and Product Designer. Caveman Cups also works with a talented remote team that includes Customer Service, Marketing, and Production Quality Control Managers as well as a talented pool of freelancers. What inspired you to create Caveman Cups? As a Mother of two children with chemical sensitivities, I searched high and low for healthier alternatives to plastic and safer alternatives to glass. When my kids were babies, we had no problem finding steel baby bottles and sippy cups, but when the were ready to transition to real cups, there was only lots of plastic, lots of glass and lots of big steel cups for adults. There were no steel cups for kids. I decided there had to be a better option and Caveman Cups was born. How did you come up with the design of the cups/bowls/plates? Did you go through a lot of design iterations before you were happy with the results? I’m a very Crunchy Mom so one of the driving values behind Caveman Cups is a passion for non-toxic and Earth-friendly living. This drives every decision, from material and product design to packaging/ink selection and the quality/working conditions of the factories we work with. The other side of product design is the mission to create products that make life safer for kids *and* easier for parents. As parents, we are concerned about the chemicals leaching out of plastics, but we also don’t want to worry about giving our little ones something that could shatter and injure them. I am always aiming for the perfect blend of functional, eco-friendly, safety, beauty and quality. For the product designs, I start with a concept based on experience with my own kids, but I also talk to other Mom’s about what they want. Once we have a working prototype, we test, test, test. Each product usually goes through 3-4 prototypes before we have it ready for production. Once the product is introduced to the market, we gather additional feedback and will continue to tweak and improve. We are lucky to have amazing customers that share feedback and suggestions for improvements and new products. What has been your favorite part of working with Caveman Cups? Caveman Cups is both a labor of love and a privilege for me. I love the challenge of creating products that are both ethical and fill a real need. And I love serving others. Our products are our original designs, created with an extreme durability that will last for generations. We intentionally left off colorful coatings, paints, logos, etc because all these contribute to obsolescence as they wear off, or become marred or “dated” designs. Though we loved the steel baby bottles and sippies our kids used, the paint was scratched up and they were all so dented that they wobble and fall over when set on a flat surface. After only a couple years of use, they were ready for the recycle bin. It seemed like such a waste. I was determined to create products that could not only withstand toddlerhood and come out the other side still beautiful, timeless and functional, but could do this again and again for generations! One of the key features of our steel products is the weight and thickness of the steel. Our steel is thicker than everything else on the market. It is very difficult to dent or damage. 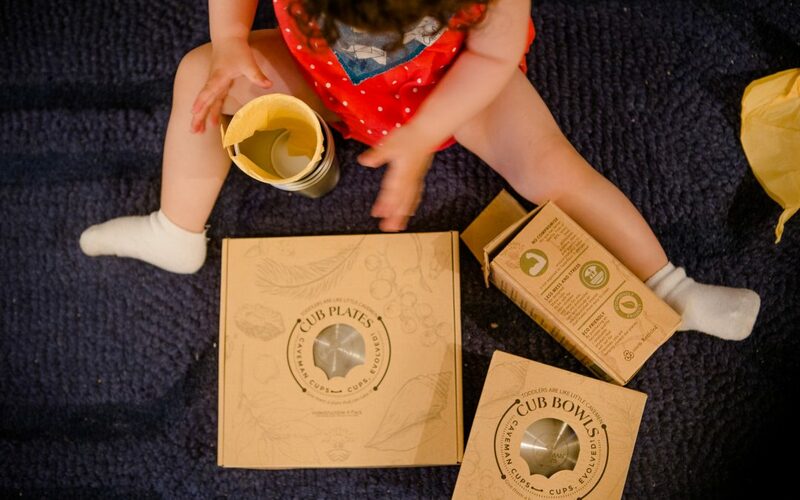 Toddlers are like little cavemen so we create products that can withstand the caveman years, and beyond! The other key feature is our patent pending “Clean Rim” that doesn’t harbor mold dirty water or old food detritus like other steel dishware with “rolled rims”. This feature is especially loved by parents. Who has time to get out the toothbrush and scrub out the rims of cups? All of our dishware can be easily washed by hand or in the dishwasher, no toothbrushes needed! We have several new products currently in the works, including the much requested larger steel products sized for teens and adults. We have seen increasing demand for our products in other countries and are excited to expand our line to the global market. Also, we are pro-actively looking to bring production of all of our products to the USA. This has always been a goal, but USA manufacturing has been in decline for so many years, that initially, we were not able to find a US based factory to produce our goods. However, 2016 has brought some positive changes for USA manufacturing and we are optimistic that our production may begin here as soon as late 2017 or early 2018. How can our readers get their own set of caveman cup products?